Of all Detroit tobacco entrepreneurs, one stands out — Daniel Scotten. Scotten started in the tobacco business in 1852 as a 33-year-old apprentice to Detroit tobacconist Isaac Miller. Sleeping at the shop and saving his money, Scotten eventually was able to finance his own enterprise which he opened to his eventual good fortune just before the Civil War. Scotten moved his enterprise to a large factory on West Fort Street in the latter half of the 19th century, when its name was changed to the Scotten-Dillon Company to reflect the addition of a corporate partner. By the 1890s the company had 1.200 employees, a weekly payroll of $8,000, and $4 million in annual sales. Daniel Scotten was involved in a variety of outside interests even into his late 70s. Possessing a peculiar horror of railways and railroad travel, he insisted on carrying on his farflung business affairs by means of his horse-drawn private coach. Scotten invested in Detroit commercial real estate to such an extent that at the time of his death in 1899 he owned nearly 2,500 city plots, the Hotel Cadillac, and business blocks along Gratiot and Randolph Streets. He left to his heirs a $7 million estate and to the Detroit Public Library his 20,000-volume private library of rare volumes. 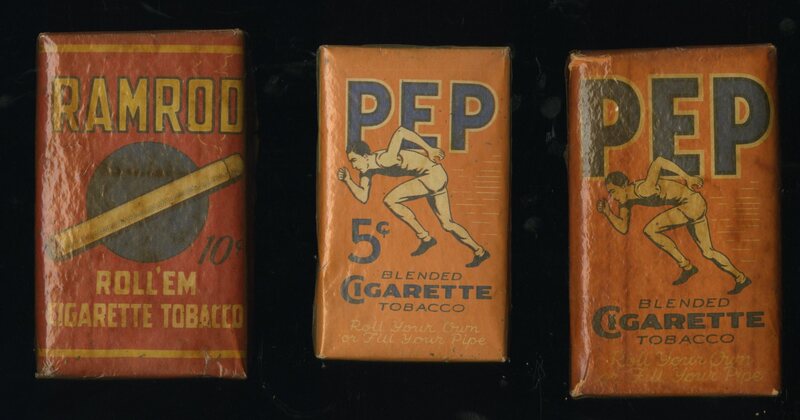 Pictured are three products of the Scotten-Dillon Company: two versions of Pep Cigarette Tobacco and one of Ramrod. There is a stamp mentioning a date in 1926, so these would have been produced sometime after. I think the Pep design is really quite successful. What is the worth of a pack of unopened pack of. Pep Blended Cigarette tobacco ??? I don’t know. I bought that one a few years ago, I think it was around $15.